For some years, Nicholas Institute for Environmental Policy Solutions’ staff have helped lead a course that immerses students in the process of negotiating a global climate agreement. The United Nations Climate Negotiations Practicum course not only teaches students about international climate negotiations and policies under the United Nations Framework Convention on Climate Change—it takes them across the world to witness and be involved in the negotiations at one of the U.N.’s annual climate conferences. At the most recent conference in late 2015, students in the practicum course were part of history. They participated in the process to reach a landmark agreement whereby more than 190 countries pledged to hold the global average temperature increase to “well below” 2 degrees Celsius above pre-industrial levels and to pursue efforts to limit that increase to 1.5 degrees Celsius. In the past five years, students in the practicum course have worked with a variety of clients, including country governments and non-governmental organizations, directly involved in the climate conferences. Since 2013, the fall semester course has been co-taught by Billy Pizer, Nicholas Institute faculty fellow and professor at the Sanford School of Public Policy, and Jonathan Wiener, Perkins Professor of Law and Environmental Policy at the Law, Nicholas and Sanford Schools, along with graduate student leadership. 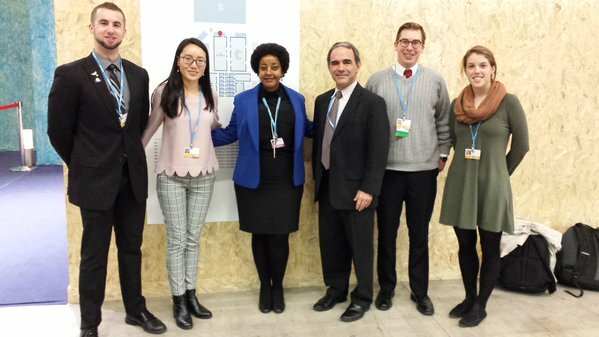 In fall 2015, with graduate student leaders Emily Pechar and Siqi Han, the course took students from across Duke units to preliminary U.N. climate meetings in Germany. Then, most of the class went on to Paris to attend the annual conference, assisting client organizations with research and text drafting, observing side events, and following the developing agreement. During the two-week conference, the students met up with Brian Murray, director of the Environmental Economics Program at the Nicholas Institute and a speaker at more than half a dozen side events covering everything from carbon markets to oceans policy. He was also serving as a mentor to the Duke students—a role someone at the Nicholas Institute has played since 2009 for students attending the conference with and without the class. In France, Murray introduced students to high-ranking environmental leaders, including members of negotiating delegations from the United States, Canada, and Ethiopia. They also met with Ontario’s Minister of the Environment and Climate Change and with the chairman of the International Emissions Trading Association. Read the students’ own interpretations of the final agreement and learn more about their experiences in France on the Duke to Paris blog. Watch video of the Nicholas Institute’s Brian Murray, Billy Pizer, and Tim Profeta discussing the significance of the agreement at a Duke event.